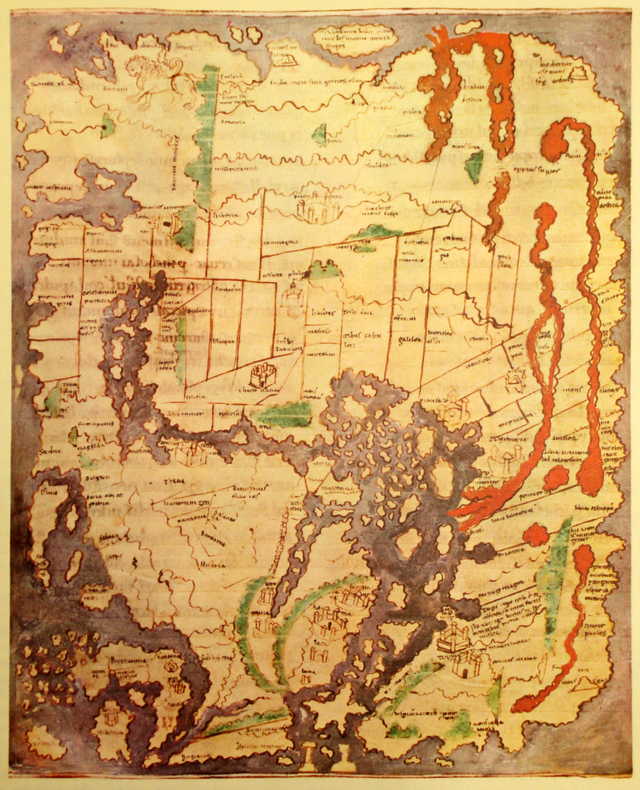 An Anglo-Saxon world map known as the “Cotton” world map (c.1040). (Looks like I’m not the only one with a sketchy sense of geography.) Image found at http://en.wikipedia.org/wiki/Early_world_maps#mediaviewer/File:Anglo-Saxon_World_Map_Corrected.png. Beowulf brings his version of the events of his swimming contest with Breca to a close. the unmarked man, when his strength thrives. nor any man so miserable on the sea. At long last, after three entries, Beowulf wraps up his account of the swimming contest. In this version, it’s unclear what exactly happened to Breca, save that he didn’t win. But it’s also clear that Beowulf’s not content to limit his tale of glory to some contest. He has to boast about how badass he was in beating up nine sea beasts! Actually, given this information, It’s safe to say that he probably didn’t rout the sea beasts in the area, only put the fear of Beowulf (and the god that he keeps invoking?) into them. Actually, Beowulf’s return to simple, straightforward language signals the audience rather nicely that his battle is over. I don’t think Beowulf is necessarily a berserker, but were he, this part of his story would show his ability to come down from his battle fury (and mescalin trip) so that he can re-enter normal society. Sidebar: Beowulf could be a berserker, though. It’s thought that his name means “bear” since it’s a combination of “bee” and “wolf” – implying a wolf that hunts out bees. Berserkers wore bear hair shirts (or just plain bear skins). If someone was called a bear straight up, then maybe it was because that person was hoped to have the potential to go fight as berserkers did. Beowulf’s showing that he so readily came down from his battle fury, along with being the denouement to his story, also might put the Danes at ease. As shown in the simplification of his diction the morning after his kill, once he’s defended himself he becomes relaxed and fully reasonable. Almost like the shore being revealed after the fury of the ocean recedes from it with the lowering tide. Now, this isn’t to say that the Danes looked at this young Geat and worried that his monstrosity would replace Grendel’s should he defeat him, but I think that the Anglo-Saxons and other early medieval people were well aware of how people who became monstrous in battle (ie: berserkers) could sometimes carry that monstrosity over to times of non-battle. Because of that I think it’s safe to say that rhetorically Beowulf’s conclusion of the swimming episode is meant to show his ability to return to society despite doing something as incredible, and well, mad, as beating up nine sea monsters in one night. But Beowulf doesn’t finish selling his ability to do what he Danes need done. In this conclusion, Beowulf also quips about wyrd. In doing so, I think that Beowulf is trying to suggest that he is favoured by this mysterious force. For, being thrown around by the sea and attacked by so many mysterious monsters definitely suggests that he is a marked man (as in line 572-573). Yet, he’s quick to add that wyrd will spare those (even those marked) when they’re at the height of their strength (l. 573). If Beowulf’s in his early twenties or late teens when he comes to Daneland, then it’s probable that he’s still at the ‘height of his strength.’ Or even that he’s at the very height of it. Whatever the specifics, wherever he is on the trajectory of his strength over the course of his life, it’s a stat that must still read fairly high (high enough for wyrd to give him some saving throws), and Beowulf, I think, is rhetorically banking on this to show the Danes that he can, indeed deal with their monster problem. He’s won glory against such foes before, so why not one more time, right? Do you think the poet had all of these meanings in mind when he/she composed/wrote out Beowulf? Or am I reading way too much into this? Well, in this week’s passage there were quite a few things to do and see word wise. This word simply means “foreign land.” However, there’s a loose thread on it to pull at. Why should there be such a thing? Because it’s a compound word. So the seam between the words of this compound comes between the two l’s. The word “land” means the same thing that it does in modern English; it refers to a country, land, or, in the most clinical sense, a span of physical space. The first word in this compound, “weal” is where things get complicated. And, carrying on with the metaphor of clothing, is where the whole thing’s aesthetic appeal comes from. Although, as with most of the compound words I dissect in this part of these entries, “wealland” was probably in such common use when Beowulf was written down as to simply mean “foreign country,” the two words that come together to make it wouldn’t have been put together without reason in the first place. So what could any of these combinations mean, and what might each say about the Anglo-Saxon world view? Well, if the original first part of the compound was “wiel,” then “wealland” implies that the Anglo-Saxons viewed foreign lands as things to be conquered. These lands were places that were ripe for plunder and invasion, places that, of course, would become subject to the Anglo-Saxons Germanic might and superiority. If this really was the original combination, then it suggests, in my mind anyway, that the word probably came together around the height of the Anglo-Saxons’ power. Argument could be made in favour of “wiel” and “land” being the original combination since the country that eventually formed beside what eventually became England is known, in English, as Wales, implying that its people (the Celts on the British mainland) were slaves or servants to their Anglo-Saxon neighbours. Though, come to think of it, the basis of this analysis means that “Wales” could also have been so named in reference to its being a place of great carnage, a field of constant battle. More generally, if this gorier meaning of “weal” is what combined with “land” originally, then the Anglo-Saxons perhaps took a more sober view of foreign lands and their potential for conquest. Instead of being unceasing optimists, they realized, somewhat philosophically (probably after having landed in Britain and growing fond of the place), that the conquest of foreign lands would lead to nothing but slaughter. Though on whose side exactly is unclear. The implication, nonetheless being that foreign lands were places of great and terrible conflicts. The third possibility for the subtext of “wealland” is simply that it’s used to refer to foreign lands that are fortified. These fortifications could be from either sea-cliffs and promontories or from walls that these lands’ people built. Since I’m not so sure about the Danes’ or Geats’ relationship with Finland (Sweden was their mutual big bad, at least in the world of Beowulf), I can’t say how the Danes are supposed to take Beowulf’s landing there. But specific to this passage, I think it’s entirely possible that this “walled land” or “sea-cliff-protected land”) is the subtext, at least in Beowulf’s use of “wealland” here. Beowulf mentions the sea-cliff and the tide receding from it after all. Plus, if he swam to Finland from the spot where he fought the nine sea-monsters its sea-side topography couldn’t be too different, right? But I feel like bringing geography into this is a bad idea. My languages and history might be all right, but my geography gets pretty terrible pretty quickly – let alone historical geography. There is also, actually, a fourth possibility for “wealland.” It’s totally possible that all three meanings could be taken from the word depending on context. I mean, if there’s one thing that I’ve often assumed in this part of these Beowulf entries it’s that one compound word with varying elements can have multiple meanings. So why wouldn’t that be the case with one used to refer to foreign lands, something that I imagine came up quite a bit in the Anglo-Saxons’ literature, poetry, and day to day dealings. Which combination do you think makes this most sense in general? What about in the context in which Beowulf uses “wealland”? Next week Beowulf starts to lay down a sick burn on Unferth. This entry was posted in Beowulf, poetry, translation, words and tagged Anglo-Saxon, Beowulf, Danes, Geats, Old English, speculation, words by NSCZach. Bookmark the permalink.